A cheese buffet is a unique, informal and educational event for a larger group of 50 people or more. We bring in a variety of eight different hand-selected cheeses and advise the event organizer on wine pairing options to choose from. 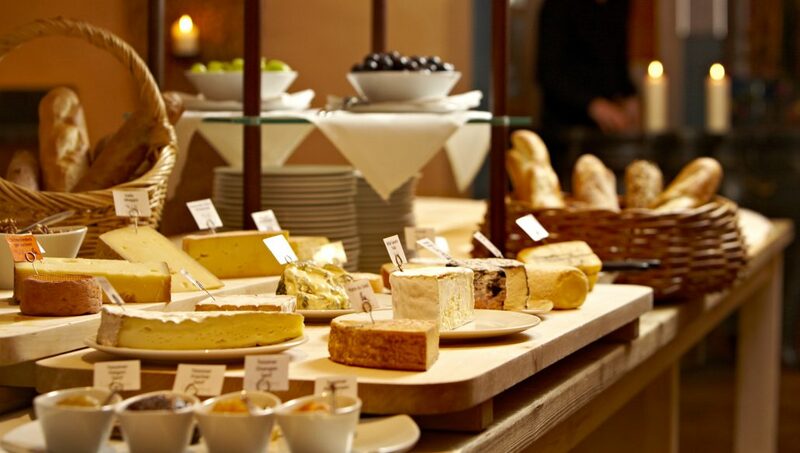 The buffet table and room are preset in advance and we populate the buffet with our cheese selections when we arrive. We talk briefly about each cheese – the history and origin, the quality, flavors, smells and distinctive characteristics and what types of wines it pairs well with. Then we have the crowd get up and head to the buffet to try the cheeses. This event is not meant to be a meal, but a light appetizer or snack. We will provide helpful information ahead of time that can be distributed to attendees so the expectations are set clearly and they understand the etiquette of the cheese buffet. Pricing ranges from $10-$20 per person with a minimum of 50 attendees. Please call for a proposal and more information. I love educating about cheese and this is one of my favorite events to teach at.